This Chinese Style Hot Pot with mushrooms and rice was handed to me by my parents, who were in turn handed it to them by my sister. None of whom seemed to want to try it, despite my sister buying it on a whim. So it fell to Cinabar and I to eat this Chinese Style Hot Pot after a night at the Grand Theatre in Wolverhampton watching the excellent and very funny Mikado, by D’Oyly Carte. On opening the huge can the sloppy brown liquid inside had a tomato and soya smell to it. I must admit on first sight I could understand why this Chinese Style Hot Pot had been handed over. I shared the contents out into two bowls. Cooking consisted of three minutes with a stir in the middle for each dish in the microwave. 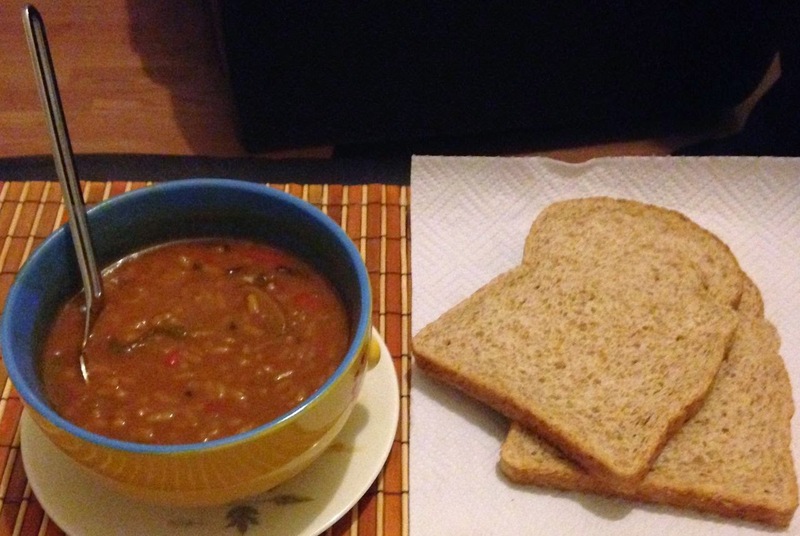 The sloppy brown soup had what looked like diced bits of onion, celery, bell red pepper, soya beans and mushrooms. On first taste Cinabar liked it, which was a good start. She stated it was nice, tomatoey and had an air of chilli con carne. 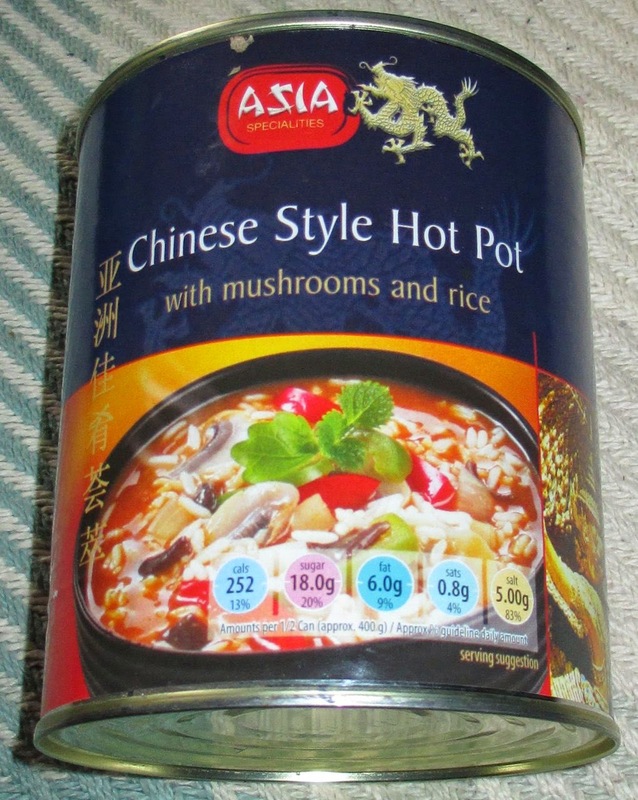 Once my bowl had cooked I instantly found this Chinese Style Hot Pot excellent for dipping in pieces of torn bread. I could see what Cinabar meant about the chilli con carne feel, but the strong taste of soya took that away for me. There were chunky pieces of mushroom and plenty of rice, amongst the other bits and pieces. I used up my two slices of bread pretty quickly. There were generous sized bits of red pepper, onions and soya beans. The brown rice soup had a medium tangy lip licking spice to it. I found this Chinese Style Hot Pot very tasty and we both really enjoyed it. It felt filling, warming and healthy, and we'd certainly have it again. 800g can with two 400g servings at 252 calories, with 18g of sugar and 6g of fat. No artificial colours or preservatives. Contains milk, egg, celery, soya, wheat, gluten and mustard. 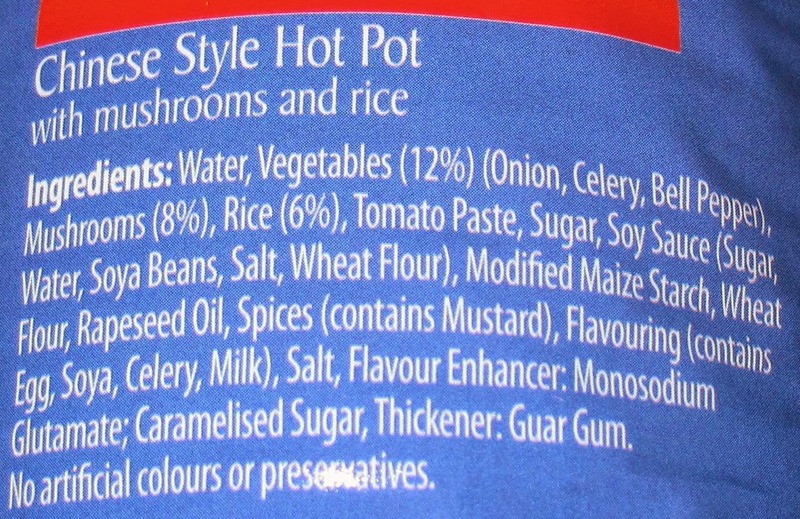 For ingredients see photograph.